Call now (949-241-7839) to schedule your FREE Brazilian Jiu Jitsu Los Angeles no-gi trial class OR fill out the form below to schedule your FREE trial class. All trial students must be LOCAL Los Angeles residents with an ID. Eddie Bravo, a 3rd degree black belt under the legendary Brazilian Jiu Jitsu master Jean Jacques Machado, started training Brazilian Jiu Jitsu in May 1994. He won the Brazilian Jiu Jitsu Abu Dhabi North American Trials lightweight division on October 5, 2002, in San Diego, California — earning the “Most Technical Fighter of the Night” award. He then advanced to the 2003 Abu Dhabi Brazilian Jiu Jitsu Championships in San Paulo, Brazil, where he secured a submission win over legendary Brazilian Jiu Jitsu fighter Royler Gracie. The Abu Dhabi Championship is the most prestigious Brazilian Jiu Jitsu no gi tournament in the world. A historic Brazilian Jiu Jitsu rematch took place 11 years later in Downtown LA Los Angeles between Royler Gracie and Eddie Bravo, resulting in arguably the greatest rematch in Brazilian Jiu Jitsu history with the epic match ending in a technical draw. Since then Eddie Bravo has published 4 books on no gi Brazilian Jiu Jitsu, released 3 DVDs on no gi Brazilian Jiu Jitsu, and is currently filming his popular Brazilian Jiu Jitsu online web-series Mastering the System. He is also known for his mixed martial arts commentating on the Ultimate Fighting Championship. **10th Planet Jiu Jitsu is a unique style of Brazilian Jiu Jitsu and is located in Downtown Los Angeles (Downtown LA). Eddie Bravo, himself, teaches 6 advanced Brazilian Jiu Jitsu no gi classes weekly at 10P HQ in Downtown LA. In addition to those advanced Brazilian Jiu Jitsu LA classes, there are 13 more advanced level Brazilian Jiu Jitsu LA no-gi classes offered to students at the Downtown LA Jiu Jitsu school, which focus on ultra high level clinching no-gi Brazilian Jiu Jitsu. 10th Planet Jiu Jitsu is the only no-gi Brazilian Jiu Jitsu school in Downtown LA. 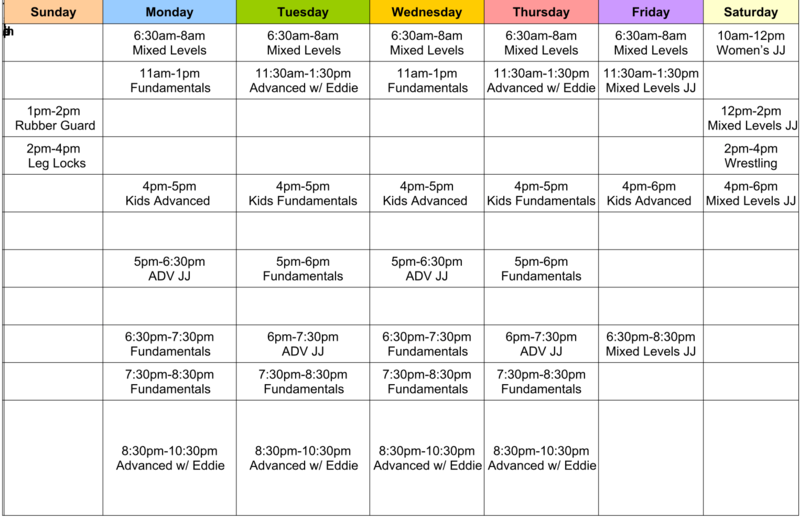 For beginner students, there are 19 classes offered weekly; these include, fundamental classes, wrestling, and mixed level Brazilian Jiu Jitsu. Also being offered are Combat Jiu Jitsu classes, which are amateur MMA classes with open palm strikes, MMA gloves optional. 10th Planet HQ in Downtown LA also offers 5 kids Brazilian Jiu Jitsu LA classes Monday through Friday. Each kids Brazilian Jiu Jitsu Los Angeles class is specifically designed for absolute newbies with safety being the highest priority. 10P HQ in Downtown LA (Downtown Los Angeles Brazilian Jiu Jitsu) also offers private Brazilian jiu jitsu no gi lessons with several of our instructors at an additional price. Specializes in Leg Locks and Rubber Guard.